The BCCI has called an Emergency Working Committee Meeting on November 18 to discuss the scheduling of its Annual General Meeting which has been postponed by four weeks after President-in-exile N Srinivasan was named by the Supreme Court in the IPL spot-fixing scandal. Having decimated the opposition with clinical precision in all four matches, India will be aiming to complete a clean sweep when they take on a struggling Sri Lanka in the fifth and final One-dayer. Viswanathan Anand failed to capitalise on an optical blunder by Magnus Carlsen and went on to lose the sixth game of the World Chess Championship. Olympic bronze-medallist Saina Nehwal and young shuttler K Srikanth stormed into the finals of the women’s and men’s singles events respectively at the $700,000 China Open Super Series Premier on Saturday. In her sixth appearance in the prestigious tournament, Saina continued her rampaging run as she produced another good show to outclass world No. 17 Liu Xin of China 21-17 21-17 in the semifinals, which lasted 47 minutes at the Haixia Olympic Sport Center. There is a strong possibility that Indian hockey might be left without a head coach after November 19. World No. 1 Novak Djokovic ended Kei Nishikori’s impressive debut at the ATP World Tour Finals with a 6-1 3-6 6-0 semifinal victory at the O2 Arena on Saturday. Despite having already qualified for the semifinals, table toppers Khalsa Warriors kept up the intensity as they outplayed Punjab Thunder 67-49 in their World Kabaddi League match here today. World champions Germany laboured to a 4-0 win over Gibraltar in Euro 2016 qualifying on Friday as Cristiano Ronaldo became the tournament’s all-time leading scorer and Scotland edged Ireland 1-0 in a blood and thunder clash. The AGM was originally scheduled for November 20 but has been postponed. It is learnt that Srinivasan will attend the meeting as the chief of the Tamil Nadu Cricket Association (TNCA) where the members of the all-powerful sub-committee of the Board will be apprised of the current situation in Chennai. “The BCCI’s lawyers will apprise the WC members of the situation and the legal implications. Obviously, for BCCI to announce a fresh date for the AGM, one needs to call a Working Committee Meeting. The AGM is now likely to be held in the third week of December,” a BCCI official told PTI today. Since the next hearing of the case in the Supreme Court is on November 24, the BCCI decided to postpone its AGM — primarily because a majority of the members want the Tamil Nadu strongman to be in the clear as he is vying for a second term as BCCI president. Yesterday, the Supreme Court named Srinivasan, his son-in-law Gurunath Meiyappan, Rajasthan Royals co-owner Raj Kundra, cricket administrator Sundar Raman, who were all probed by the Mudgal committee. The top court said had it had found “some misdemeanour by certain persons” and indicted them in the IPL-6 scam. It also ordered that supply of relevant portions of the report to the four so that they can file their objections within four days of receipt of the report. “Certain findings recorded by the Committee are understood to have indicted some individuals against whose conduct investigation has been conducted. The report also deals with the conduct of the players which are for the present held back,” the two-member Supreme Court bench observed. Besides election, the AGM usually lists several matters, including confirmation of minutes of the previous general meetings, adoption of the secretary’s review report, adoption of treasurer’s report and the audited accounts, adoption of the annual budget, appointment of auditors, election of working committee, standing committees and other sub-committees and appointing India’s representative to the ICC. With the series already in their pocket, the Virat Kohli-led team would like to finish with a 5-0 result, which will be a confidence booster with the ICC World Cup starting in less than 100 days’ time. If India have been thoroughly professional in their first three outings, the penultimate one at Eden Gardens, turned out to be historic with Rohit Sharma smashing his way into the record books with a highest individual ODI score of 264 as India routed the Islanders by 153 runs. The bowling has lacked the venom in absence of their sling-arm fast bowler Lasith Malinga. Fielding has failed completely. Rohit, incidentally was the third Indian centurion in the series to have been let off early in his innings. He was dropped on four by Thisara Perera who let go a regulation catch. The Mumbaikar unfortunately missed out on the first three ODIs as the team had already been picked by then but he had made his intentions clear with a 111-ball 145 in the warm-up match against Sri Lanka, his first competitive game since recovery from hand injury. Rohit was brought in place of Shikhar Dhawan, the leading run-getter in the series so far, in a slew of changes for the last two ODIs and has seized the opportunity. It was a lesson to watch Rohit pace his innings as the Mumbaikar took 100 balls for his first hundred and took 73 balls for the next 164 in an incredible innings. It has not been a one-batsman show. Everyone in the top order has contributed, be it opener Ajinkya Rahane or the new No. 3 Ambati Rayudu, while skipper Virat Kohli has shown amazing maturity in backing up his teammates. In the bowling, Umesh Yadav has been a revelation with the new ball and leads the tally with 10 scalps, while rookie left-arm spinner Akshar Patel is posing to be a tough competitor for Ravindra Jadeja with nine victims from four matches. It remains to be seen whether the team think tank chooses to tinker in the line-up, bringing in the likes of Ranganath Vinay Kumar and Kedar Jadhav to have a look-in. Ranchi: With the series already in pocket, the Indian team management has decided to rest Suresh Raina for the fifth ODI. “For tomorrow’s game, we don’t have Suresh available. He is being rested. Everybody else is available for selection from the squad we had in the last match,” India assistant coach Sanjay Bangar said. Carlsen, thanks to the lucky victory, surged ahead in the match for the second time and now leads the match by 3.5-2.5 at exactly the half way stage with six games still remaining. At the same point last year, the Norwegian had taken a two-point lead in the match and it was effectively all over for Anand. The missed opportunity, which could have turned the tide of the match, came in a situation that was already worse for the Indian. It was Sicilian Kann by Anand, a shocker in itself as the last time this opening featured in a World Championship match was during the Kasparov-Karpov matches in the 1980s when mostly it was the Gary’s gambit on Kasparov’s mind. Surely, Carlsen got a stronghold on the position in quick time and gave little hope to Anand which was a clear indication that Anand had gone for a wrong choice. The queens got exchanged pretty early in the opening giving Carlsen a fine advantage to fight for victory. The blunder by Carlsen was, in fact, quite uncalled for as he had another move to reach the same position, which would have given him a similar result in the game. When asked if he kept a poker face realising his mistake, Carlsen said, “I was not poker faced at all. I could have reached the same position via a different move order but I made the mistake.” Anand on his part was quite disturbed at the outcome during the press conference and Fabiano Caruana’s tweet that ‘Vishy won’t be able to sleep tonite’ seems apt for the Indian ace. “Missing out on a winning opportunity is one thing, but Anand simply capitulated once under pressure,” said Grandmaster Abhijeet Gupta, who was following the match at his home in India. 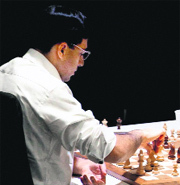 Gupta also noted that Anand could have posed a better fight towards the end but simply lost when put under pressure. Coming on a series of good results in the match this is a shocker for Anand at the half way stage. Olympic bronze-medallist Saina Nehwal and young shuttler K Srikanth stormed into the finals of the women’s and men’s singles events respectively at the $700,000 China Open Super Series Premier on Saturday. In her sixth appearance in the prestigious tournament, Saina continued her rampaging run as she produced another good show to outclass world No. 17 Liu Xin of China 21-17 21-17 in the semifinals, which lasted 47 minutes at the Haixia Olympic Sport Center. The world No. 5 Indian will take on the winner of match between fifth seed Bae Yeon Ju of Korea and Akane Yamaguchi of Japan, in the summit clash. World No. 16 Srikanth too set up a mouth-watering finale with two-time Olympic and five-time world champion Lin Dan after his opponent in the men’s singles semifinal, Marc Zwiebler of Germany, retired midway in the second game, with the Indian leading 21-11 13-7. Saina took time to get going initially as Liu opened up a slender 7-4 lead but the Indian soon clawed back and went into the interval with a narrow 11-10 lead. She came out all guns blazing after that to create a huge 19-13 gap. The Chinese girl reeled off four points to reduce the margin but the Indian soon pocketed the first game. In the second game, Liu once again marched ahead 5-2 but Saina didn’t take much time to draw level and enter the break with a two-point lead. At 14-14, Saina hit long allowing Liu to take the lead. The Chinese then won an aggressive rally when Saina failed to connect and hit wide. However, Liu then fell prey to a series of unforced errors as Saina soon moved to a three-point cushion. Liu once again hit wide helping Saina clinch her berth in final. The Sports Authority of India (SAI) and Hockey India (HI) are just not ready to accede to Terry Walsh’s “unreasonable” demands to include the provision of 120-day paid leave in his fresh contract and the appointment of Australia-based sports and medicine experts. The decision-makers have little time to decide on the future of Walsh, who has stoutly maintained that he would resign from his position, if his list of ‘requests’ are not fulfilled before his contract expires on November 19. The Sports Ministry has appointed a three-member panel, comprising Ajit Pal Singh, Ashok Kumar and Zafar Iqbal, to assess the demands made by Walsh. The panel will meet on Monday to give its final recommendation. “He is making some unreasonable demands which are not possible for the government to accept. It wasn’t possible for the SAI to grant him 120 days of paid vacation per years. He is entitled to 30 days’ paid leave as per his existing contract. We can give him another 30 days’ extension in the fresh contract, but to ask for four months paid leave, it’s not part of our system. Besides asking for more decision-making powers for himself, he also wants handpicked personnel as his support staff,” a committee member told The Tribune. “The combined salary of Roelant Oltmans (High Performance Director), Matthew Eyles (scientific advisor), Neil Hawgood (senior women’s team coach) and Walsh stands at approximately $44,000 per month. Now Walsh wants a medicine expert too from his own country, that’s not acceptable. Our experts are good enough to work with the team and we wouldn’t be paying them in dollars,” he added. The member informed that Walsh, on Friday, had been told to put forward an acceptable proposal. It has been learnt that Walsh had been offered the job of High Performance Director by Hockey Australia. The Serb was rattled by a mid-match onslaught from the Japanese who came back from a poor start to dominate the second set, only for his challenge to fizzle out in the decider. Things could have been different had Nishikori, the first Asian man to qualify for the year-ender, converted the two break points he had in the first game of the deciding set. But Djokovic held firm and quickly regained control to march towards a 31st consecutive victory on indoor courts. He set up a match point with a searing crosscourt forehand winner and US Open runner-up Nishikori double-faulted to end the contest after one hour 27 minutes. “Kei was playing great and this has been the best season of his life but he made some crucial double faults in the third set,” seven-times Grand Slam champion Djokovic said. Djokovic had gone through the group stage with wins against Marin Cilic, Stanislas Wawrinka and Tomas Berdych for the loss of a mere nine games, a tournament record. The 27-year-old, who has already clinched the year-end world No. 1 ranking, can become the first man since Ivan Lendl (1985-87) to claim three consecutive Tour Finals crowns. Stanislas Wawrinka qualified for the semifinals as he quickly secured the three games he needed against Marin Cilic late on Friday. Earlier, Vancouver Lions rallied from a slow start to overwhelm United Singhs 70-51 and keep their chances of making the last four alive. Vancouver moved to 20 points with one more game to go, while United Singhs (25 points) have already assured themselves a berth in the semifinals. Three teams — California Eagles (22 points), Punjab Thunder (21) and Vancouver — are in the fight for the last two berths. The three teams have a match each to play. Vancouver raider Gagandeep Sabrawa was named the man of the match for his 16 points. Sandeep Singh Sandhu (nine points) of United Singhs was adjudged the best stopper. Elsewhere, 2004 champions Greece were humiliated 1-0 by the part-timers of the Faroe Islands to pile the pressure on home coach Claudio Ranieri whose team have now lost their last four home games. In Nuremburg, Thomas Mueller scored twice with Mario Goetze adding a third for Germany before Gibraltar defender Yogan Santos put through his own goal. The win lifted Joachim Loew’s World Cup winners into third spot in Group D but the anticipated goal bonanza against a side who had conceded 17 goals in their first three games failed to materialise. Germany missed the chance to finish 2014 second in the table and their unconvincing display drew some boos and jeers at the final whistle. Poland have a three-point lead over Ireland, Germany and Scotland as they maintained their undefeated start with a convincing 4-0 over Georgia in Tbilisi. Injured Clarke may miss Test series against India: Skipper Michael Clarke will miss the rest of Australia’s One-day series against South Africa with a persistent hamstring injury, Cricket Australia said. Clarke reinjured his troublesome left hamstring as he made just 11 in the Australian innings of Friday’s 32-run win over the Proteas in the series opener in Perth and took no further part in the game. Scans confirmed that Clarke would miss the remaining four ODIs against the Proteas, but no decision has been made on his availability for the opening Test against India in Brisbane, starting on Dec 4. NorthEast United held FC Pune City to a goalless draw in Pune on Saturday. It is the seventh goalless draw in ISL -2014 and the fifth in last seven matches. SA might be spared Johnson factor in final ODIs: Australia paceman Mitchell Johnson may be rested after the second One-day International against South Africa to keep him fresh for the Test series against India and next year’s World Cup, the left-arm speedster said. “It’s looking that way at the moment,” Johnson said when asked if he might stay in his home-town Perth with family after second ODI at the WACA. Mominul ton sets Zimbabwe record target: Mominul Haque scored his fourth Test century to leave Zimbabwe chasing a world record 449-run target to win the third and final Test against Bangladesh. Mominul made an unbeaten 131 as Bangladesh piled up 319-5 in their second innings on fourth day. Brief Scores: Zimbabwe: 374 and 71/1 (Raza 43*, Masakadza 26*) need another 378 runs to beat Bangladesh: 503 and 319/5 dec (Mominul 131*, Tamim 65). Sejwal wins fourth title at National Aquatic C’ship: Asian Games bronze medallist Sandeep Sejwal (in pic) added a fourth title to his kitty, even as five national records were set on the fourth day of the 68th Senior National Aquatic Championship here today. Sejwal comfortably won the 100m breaststroke in a timing of 1:02.81 to swell Railways’ medal tally. It was his fourth title of the meet. Promising Gujarat swimmer Maana Patel set the national record in the 50m backstroke with a timing of 30.38. The Maharashtra quartet of Monique Gandhi, Jyotsna Pansare, Avantika Chavan and Aditi Dhumatkar set a second national record with a timing of 04:03.05 in the women’s 4x100m freestyle. Rashid, Randhawa tied 2nd in Chiangmai Classic: Rashid Khan turned in a strong finish, making birdies on the last two holes, to move into second place, even as overnight leader Jyoti Randhawa bogeyed the closing hole to drop alongside him after the penultimate round of the Chiangmai Golf Classic here today. Meanwhile, leading the field was Thai Thanyakon Khrongpha after firing a five-under 67. He was at 15-under 201, two shots ahead of Rashid and Randhawa. S Chikkarangappa (69-72-71) was tied 29th, while Shubhankar Sharma (71-70-72) was tied 32nd alongside Chiragh Kumar (69-75-69) at three-under 213. Abhijit Chadha (71-74-73) and M Dharma (70-74-74) were tied for 60th at two-over 218.